Hello all! Last week, I replayed a game that turned out to be a huge influence on modern action games. This week, I'm going way back to 1991 for a Game Boy classic. Many of you consider this to be a weak chapter in the series, but I like it. Metroid II: Return of Samus was one of the first Game Boy games I can remember playing (y'know, aside from Tetris). Being a sequel to the instant classic Metroid, this game saw you play as bounty hunter extraordinaire once again as she investigates a new planet called SR388. Samus is sent there in a bid to exterminate the Metroid race. Everyone by now is familiar with the Metroid formula: you explore the world in a nonlinear fashion until you find weapons and abilities that enable you to progress to places you couldn't access previously. It's the same in Metroid II, although it's made slightly more linear due to the Game Boy's limitations. Still, the world is impressively big for it's time. By no means is this a short game, but it's not as long as, say, Super Metroid or even the first game. This linearity was due to the Metroids themselves. See, you couldn't make any progress deeper into SR388 because of liquid that would kill you if you tried to dive in. Killing Metroids, however, would cause the liquid to withdraw for, um, reasons. It's quite a clunky solution when you think about it, but it's likely the best they could do with the tech they had at the time. Besides, I feel like the Metroid designs make up for it. Rather than fight the same Metroids over and over, in Metroid II, you had to hunt them down and exterminate them. The thing was, though, the Metroids would evolve as you went through the game, going through Alpha, Beta, Zeta, and Omega forms, each stronger and generally more terrifying than the last. It kinda makes up for the fact that you don't run into a large variety of enemies in the game. I also loved the Queen Metroid boss fight at the end. Truth be told, I never found the fight against Mother Brain in the first Metroid to be that exciting. I just didn't see the appeal of firing at a stationary blob. It was better in Super Metroid, but still. Here, though, the Queen Metroid is the final boss, and it's a huge, angry monster. Granted, again, you're basically standing in one spot, but you're also dodging a significantly more aggressive enemy than Mother Brain was. Also, it's design. The Queen Metroid was artistically consistent with every Metroid that came before it, taking elements from all four Metroid forms, while also remaining original. It's almost as if most of the graphical power in this game was spent right here. And speaking of graphics, Metroid II is quite pretty for it's time, if a bit simple. 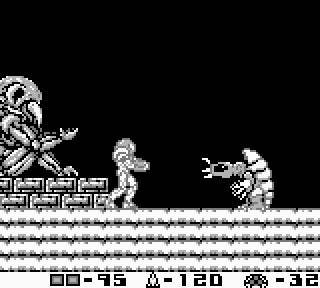 It captures the look of the first Metroid despite being in black and white (or, um, pea soup-green if you're playing on the original Game Boy). The environments are a bit sparse sometimes, but Samus and the Metroids are nice and big on screen. Samus herself seems a little oversized at times, but it's cool. It's so catchy, and adventurous, and I think it's a bit better than the Zebes music in the first Metroid. I look forward to your hateful comments on the issue. *may not be as awesome as you remember. Next week, we're going a bit dark, into a game filled with crazy people, serial killers, and wacky crime solving tools. Here's a big hint: this game on 360 has only 970 Gamerscore points, because reasons.